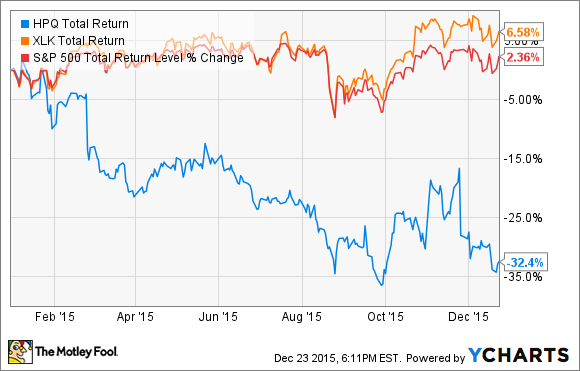 In 2015, Freeport-McMoRan, Kinder Morgan Inc. and HP Inc. proved that a high dividend yield is no panacea. The post-crisis world of zero interest rates and quantitative easing has suffered a global yield famine, leading many investors to gamble on high-yield (and high-risk) stocks. But a high stock dividend yield doesn't compensate investors for savage price declines -- especially when it signals that the dividend is about to be cut. As we turn the page on 2015, it's time to recognize three of the worst-performing high-yield stocks of the year: Freeport-McMoRan Inc. (NYSE:FCX) (-71.7%, as of Dec. 23), Kinder Morgan Inc. (NYSE:KMI) (-61.8%), and HP Inc. (NYSE:HPQ) (-34,3%). These figures represent total returns and lead an investor with just one thing to say: "ouch." For the purposes of this article, I restricted myself to the stocks in the S&P 500 and defined high-yield dividend stocks as those that had a dividend yield at the start of the year that was at least half again as much as that of the index. Thus, only stocks with a dividend yield greater than 2.925% ((1.95%)*(1.5)) qualified, which left only 88 stocks out of 500. In nominating HP, I'm ignoring the strict return ordering: Freeport and Kinder Morgan were the worst and next to worst, but HP was only the ninth worst performer. I did this to venture outside the energy and materials sectors: Eight of the bottom 10 were commodities-related companies, which of course says something in itself. With commodities markets experiencing their worst rout in a decade (hadn't you heard? the "supercycle" is moribund), the mining sector suffered a veritable carnage in 2015, with the MSCI Metals and Mining Index exhibiting a price loss just shy of 40%, according to data from Bloomberg. Many of the miners were caught flat-footed by the severity of the downturn in commodities prices and had to scramble to raise cash and reduce debt by any means -- and they continue to do so. In many cases, that has meant slashing or suspending the dividend. Freeport-McMoRan was no exception: Adding insult to the injury of a nearly three-quarters decline in its stock price, the world's largest publicly traded copper producer reduced its dividend by 84% in March, before suspending it altogether earlier this month, and that's in addition to multiple rounds of announced cuts in future capital expenditures. Has the market overshot on the downside? At least one exceptional investor thinks so: At the end of August, Carl Icahn disclosed an 8.5% economic interest in Freeport. The shares leapt 29% on this news, but they have since declined by more than a quarter. 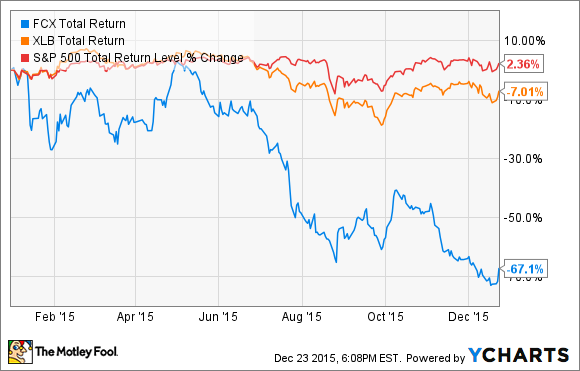 For a discussion of whether Freeport-McMoRan will restore its dividend in 2016, my Foolish colleague Matthew DiLallo provides his assessment here. Pipeline giant Kinder Morgan has been a darling of yield-starved investors for several years. The argument for the safety of the dividend was that pipeline operators own irreplaceable assets; as toll collectors on the energy supply chain, they are immune to the vagaries of the underlying oil and gas markets. That argument is valid to a certain extent, but the current bear market in commodities has dragged us beyond its limits. Earlier this month, Kinder Morgan cut its dividend by three-quarters. Capital expenditures, debt repayment, or dividend: Something had to give, considering the company has accumulated $41 billion in debt. The first two things are vital, and the third is not. The proof of that observation is that the announcement arrested a six-day decline in the stock that had seen the company lose a third of its market value. The company said it expects to distribute $0.50 in dividends next year. Based on a closing price of $16.41, that equates to a yield of 3.05%. At the beginning of November, Hewlett-Packard, a Silicon Valley institution, completed its separation into a hardware business under HP Inc and a higher-growth business focused on corporate customers, HP Enterprise Co. The breakup was a reversal in strategy, following years of pursuing growth through acquisitions, many of which were value-destroying. Even though the economics of the computer hardware business are challenged, HP still produces significant free cash flow, much of which it will continue to return to shareholders. In the earnings conference call on Nov. 24, HP Chief Financial Officer Cathie Lesjak told analysts and investors the company remains committed "to a total capital return to shareholders for the full year [fiscal 2016] to be at the high end of our overall framework of 50% to 75% of free cash flow." HP's forward-looking dividend yield is 4.25%, based on the company's guidance of a quarterly dividend set at $0.124 in fiscal 2016, which certainly qualifies it as a high-yield dividend stock. Furthermore, at 7.2 times next twelve months' earnings-per-share estimate, the shares statistically cheap. However, in the context of a hardware market for which the long-term trend looks pretty grim, this high-yielder is not for widows and orphans. 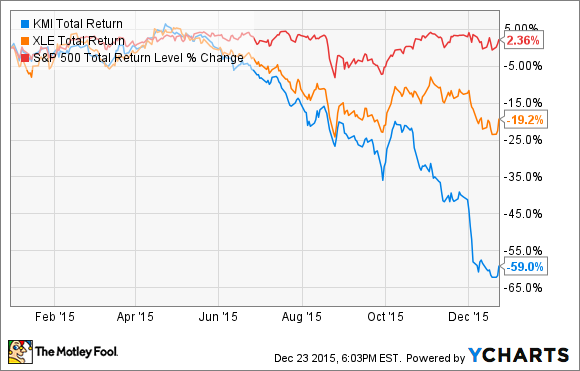 What have we learned from this year's high-yield underperformers? In 2015, miners and energy companies demonstrated once more that a very rich yield can be a siren song, beckoning investors in before vanishing. With Conoco Phillips, BP plc, and Royal Dutch Shell plc currently yielding above 6%, 7%, and even 8%, respectively, it's not unreasonable to think that, despite their protestations to the contrary, these supermajors may well inflict the same indignity on their shareholders.